Thanks to Dr. Nicos Nicolaou and Dr. Oana Rafael, Lenox Hill Hospital, New York (USA), for contributing this case. To contribute a Case of the Week, follow the guidelines on our Case of the Week page. (1) Last week, we posted a new Management article by Mick Raich, President, Vachette Pathology, "An Overview of the New Proposed Medicare Fee Schedule". Click here to see more Management related articles. (2) If you have not yet seen information on upcoming Webinars that Ventana and ASCP are sponsoring, you can view them here. Check back often, as we continue to add new information as it becomes available. (3) We have a new email list for Promotional and Commercial Emails. The Promotional email is sent out before the USCAP and CAP / ASCP conferences, and lists special promotions for our visitors (click here for the last Promotional email). The Commercial emails are sent from time to time, as requested by advertisers, but no more than once a month. With each Commercial email, we award an Amazon.com gift card (currently $50) through a drawing of recipients who respond that they are interested in receiving it (more details are at the bottom of the Commercial email). (4) Our Commercial Email contest winner for August is Dr. Lik Lee, New York (USA). He was sent a $50 Amazon gift card. Our lucky September contest winner will be announced soon. Please make sure to read our sponsored emails for a chance at another contest! (5) The Pathologist Jobs Report for the second quarter of 2015 has now been posted. It is also available from the Jobs page, or by clicking here. (6) For August 2015, we averaged 20,539 visits per day (up 13% from last year), and had 636,722 total visits. Our Jobs pages had 43,516 visits, the Fellowship pages had 6,538 visits and the Conference page had 9,020 visits. We posted 47 Pathologist job ads in August, a record. (7) We recently added Steven Alexander Mann, M.D. to our Membership page. 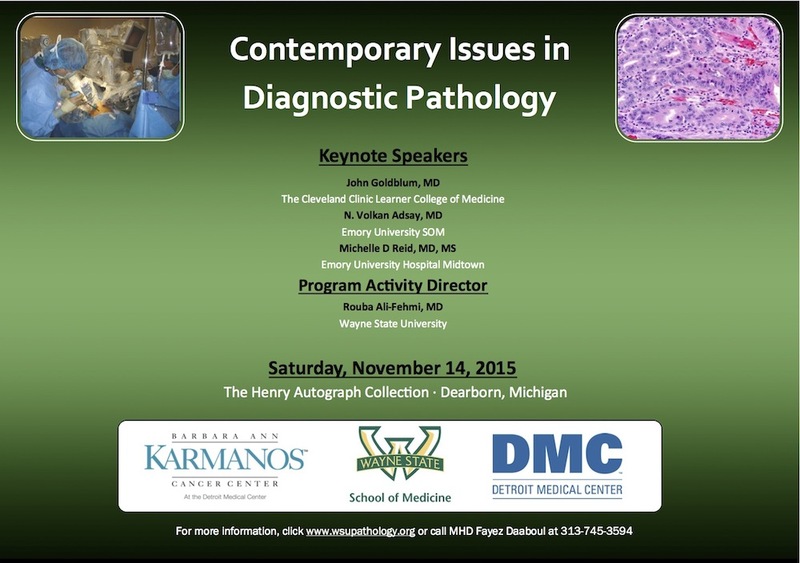 Thank you, Dr. Mann, for supporting PathologyOutlines.com! Visit our Individual Membership page to see why you should become a member too! (8) Visit our Blog to see recent updates to the website. 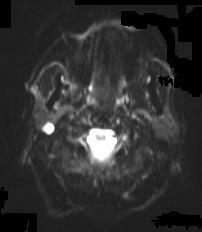 A 59 year old man with hypothyroidism presented with headaches. 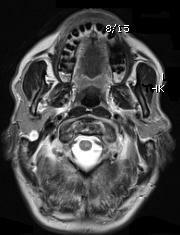 Non-contrast magnetic resonance imaging (MRI) showed no CNS lesions, but a nodular mass in the right parotid gland. The lesion was completely excised, and was 3.7 x 2.3 x 2.0 cm, pink-tan, soft, fibroadipose tissue with a 1.7 x 1.1 x 1.0 cm well circumscribed glassy white tan nodule with yellow flecks abutting the inked surface. 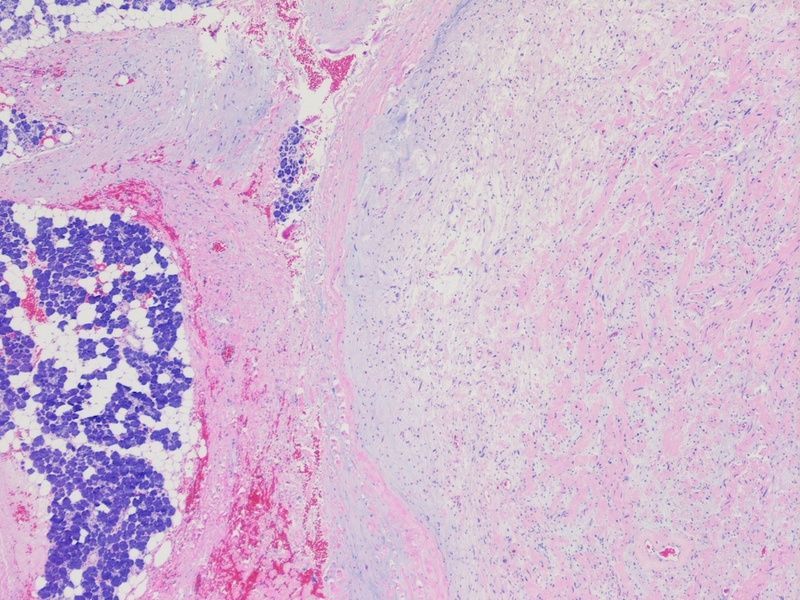 A preliminary diagnosis of myxoid neoplasm was made intraoperatively. 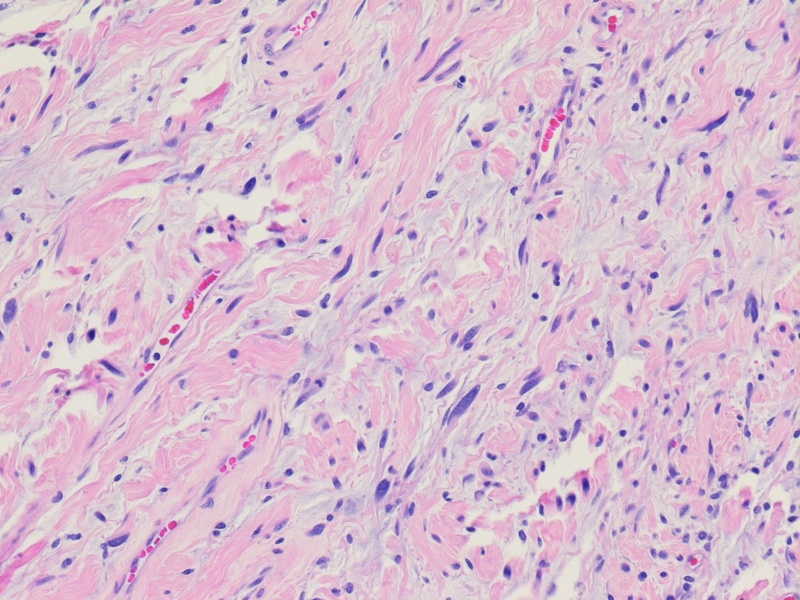 Neurofibroma is a well-differentiated benign nerve sheath tumor composed of a variable mixture of Schwann, perineurial-like and fibroblastic cells. In the general population, neurofibromas are far more often sporadic than associated with neurofibromatosis. 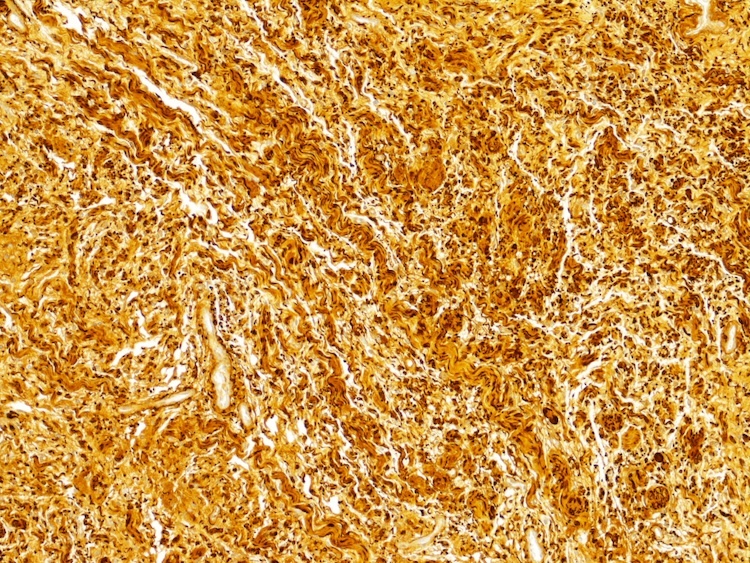 Histolopathologic examination in this case showed the presence of a well-circumscribed, moderately cellular lesion composed of cells with wavy nuclei and eosinophilic cytoplasm interspersed with wisps of collagen and mucoid material. Mild nuclear atypia was noted. 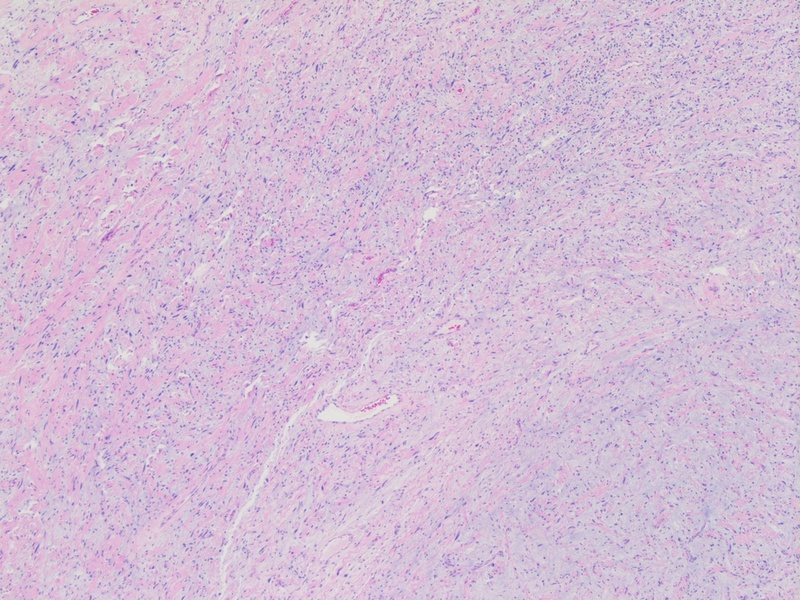 Mitotic figures were extremely rare (< 1/10 HPFs) and there was no evidence of necrosis. 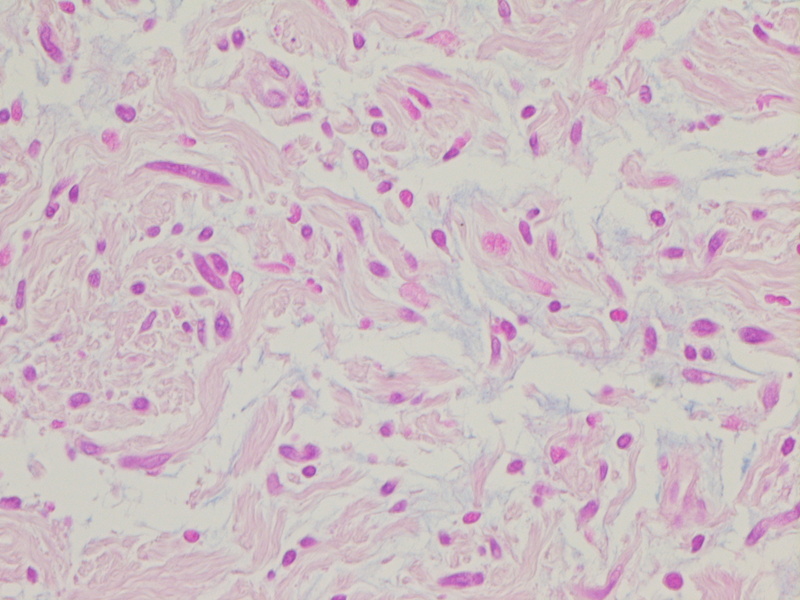 The tumor showed strong and diffuse reactivity with S100 and was negative for pankeratin and EMA. The proliferation index was less than 5%. 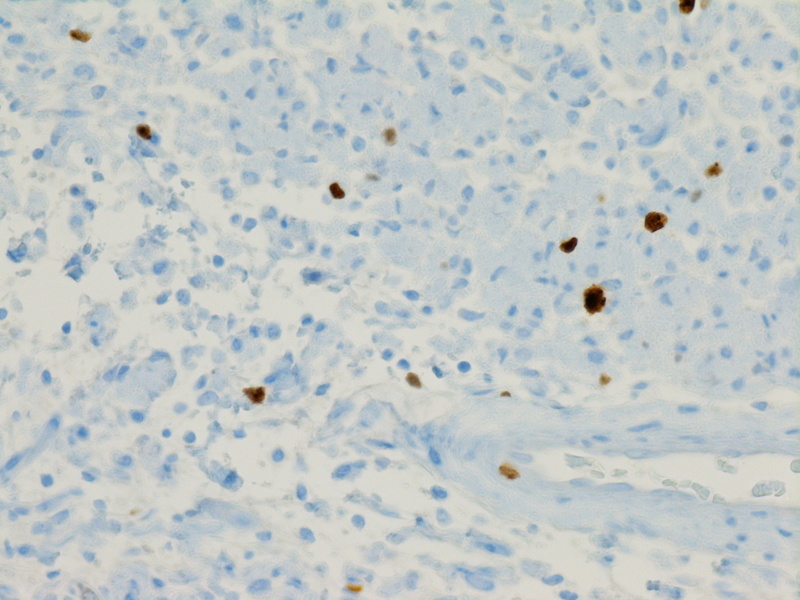 Alcian blue highlighted the mucoid material within the tumor matrix. 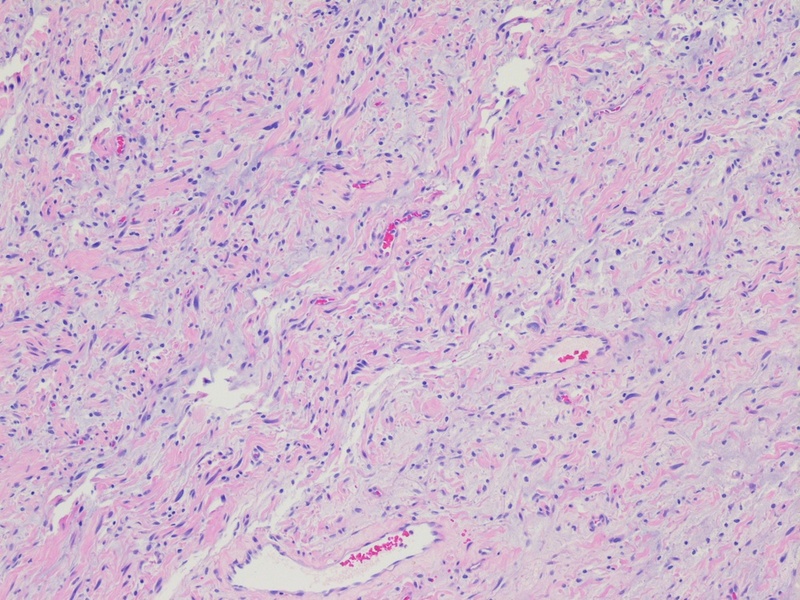 This constellation of features is classic for neurofibroma. In addition, mast cells are usually present in the microenvironment, although this feature is not specific. 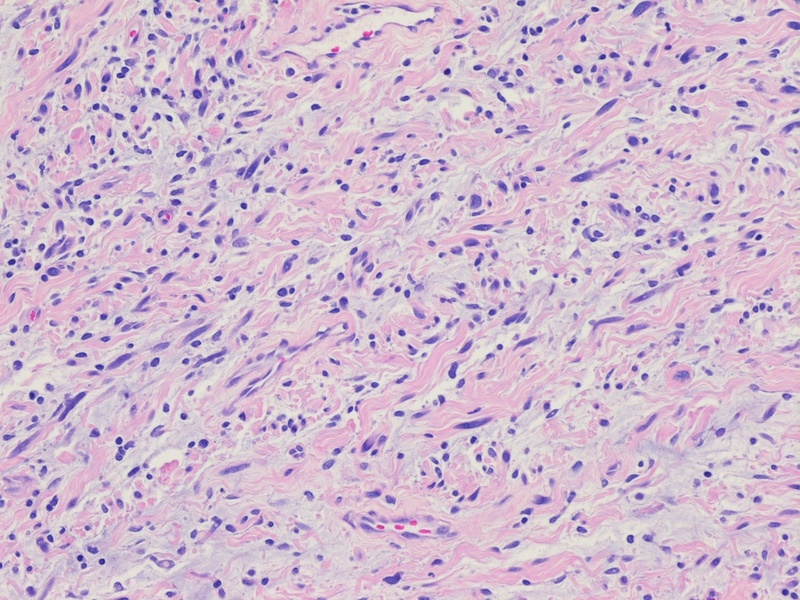 Neurofibroma occurring in the parotid gland is extremely rare, constituting only 0.4% of all salivary neoplasms. 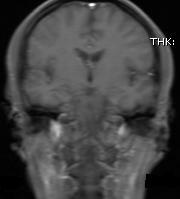 When it does occur in this location, it is usually in patients with neurofibromatosis type 1 (NF-1). Solitary neurofibromas can occur in the absence of NF-1, and in this case, close monitoring is required to ensure that other stigmata of NF-1 do not develop in the future. 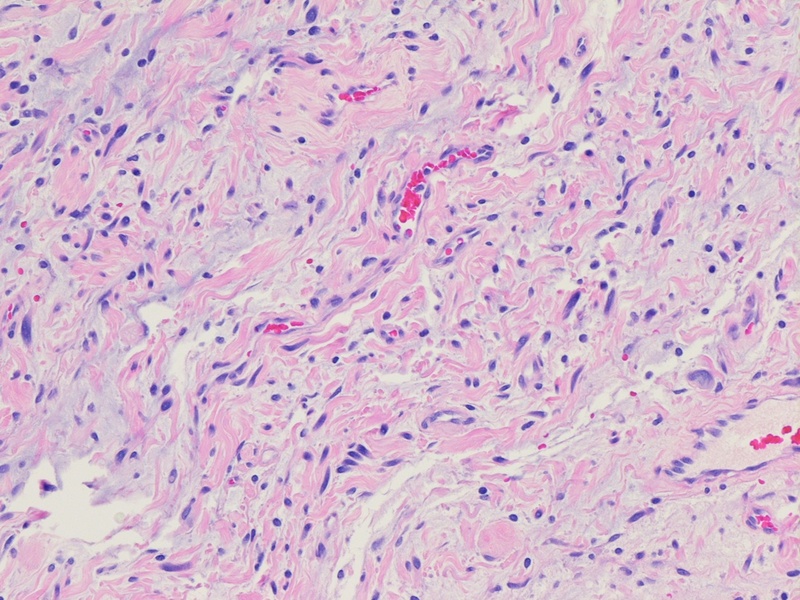 Diagnostic confusion may arise when unaware of the possibility of a neurofibroma in this unsuspected site. Morbidity is due primarily to facial nerve palsy and pain. Surgical removal is recommended for symptomatic patients and for those with NF-1 due to the risk of malignant transformation. Overall the prognosis is excellent, although potential complications of treatment may arise and vary depending on the location of the tumor. These include disease recurrence, facial nerve compromise and CSF leak.